As you probably know Google offers some excellent resources to help teachers make the best of virtual reality technologies in their instruction. One popular tool in this regard is Expeditions. This is a virtual reality tool built for the classroom to help students join immersive virtual trips all over the world. 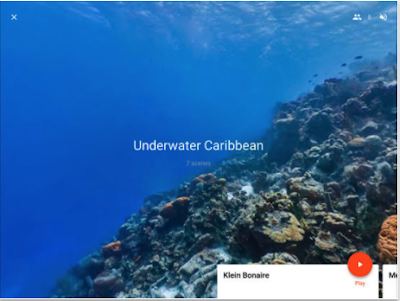 There is also Google Expeditions Series created with the help of different partners that provide virtual tours of places and citifies from all around the world. Some of these tours have even accompanying free lesson plans teachers and educators can use in class. Another important virtual reality resource we want to highlight in this post is Discovery TRVLR created by Google in partnership with Discovery. The series feature virtual reality tours filmed on Jump cameras. ‘Discovery TRVLR takes you on voyages to all seven continents, and by focusing on locals, you’ll uncover the hidden stories of these places and learn things you’d never see in a travel guidebook.’ Until now some of the places covered include a virtual dive into a bottomless cave in Auckland in New Zealand, a visit to the haunting island (Isla de las Munecas) in Mexico City, a tour of the underside of Cape Town with a cab operator, and ‘cap it all off riding alongside a polar explorer through ice caves and the frozen tundra of Antarctica.’ You can follow these Discovery TRVLR series on YouTube or through the 'Discovery VR app on app on Daydream, and watch them with your Cardboard or Daydream View'.